The British summer seems to be pretty relentless at the moment. Bar a few days of rain, it’s almost wall-to-wall sunshine and the heat is almost unbearable throughout the day. Sitting in your conservatory, then, is probably not a good idea. These glass rooms on our houses are designed to make the most of the sun we get in the UK, heating up easily and retaining that heat so that we can have the summer feel all year round. But when it’s hot, it’s hot in there. However, with the lack of rain comes another problem. Dust. There’s dust everywhere, and it’ll stick to the glass of your conservatory, meaning when you do want to use it, whenever this summer heat relents, it’ll look particularly dirty. So, now’s a good time to clean it, but you need to be careful. Don’t climb on the roof! 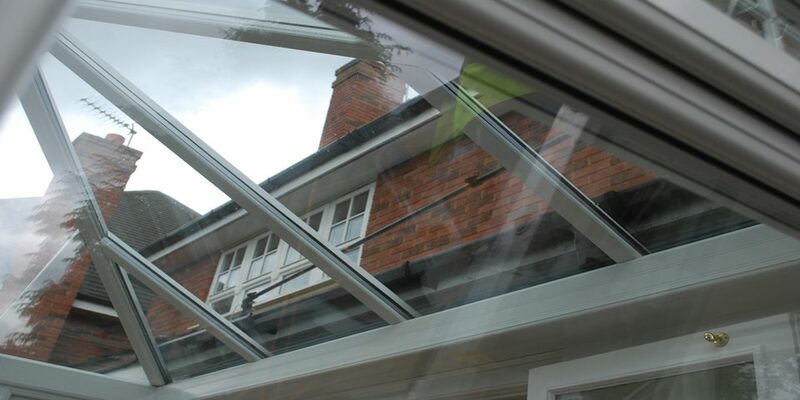 The roof of your conservatory is unlikely to be “load bearing”, that is, they are safe enough for their own weight, indeed, they’ll be designed with safety in mind, but you can’t stand on them. If you try to, or even try to crawl across them, you run the risk of falling through. Nope, if you want to clean your conservatory roof, you need to use some fairly expensive equipment, usually a telescopic brush and a ladder, but again, be careful where you lean the ladder and make sure it’s positioned safely. The ideal way to clean it is with a clear mineral water (like we use), however other soapy solutions are OK as long as you clean them off with clean water or a jetwash. Traditional soapy window cleaning liquids can leave streaks, which could make it look a lot worse that it does now. Also, remember to close all your windows and vents, else you’ll spray everyone relaxing inside! You probably don’t need to clean your gutters that often, probably once or twice a year, but this really depends on the general maintenance of your house roof and if there are any trees or large plants around. In one case, an old roof had lots of moss on it that was constantly falling into the guttering all around the house, including the conservatory. This meant it had to be cleaned regularly. The easiest way is to use a ladder and some rubber gloves to simply wipe the gutters clean. Sound a bit like hard work? Of course, the easiest, and sometimes cheaper option is to get someone to do it!